My favorite thing to do right before the holiday season begins is go to the Molly Mo's Holiday Treasure Antique Show. You would think that year after year the style of the show would alter or change, but it doesn't. 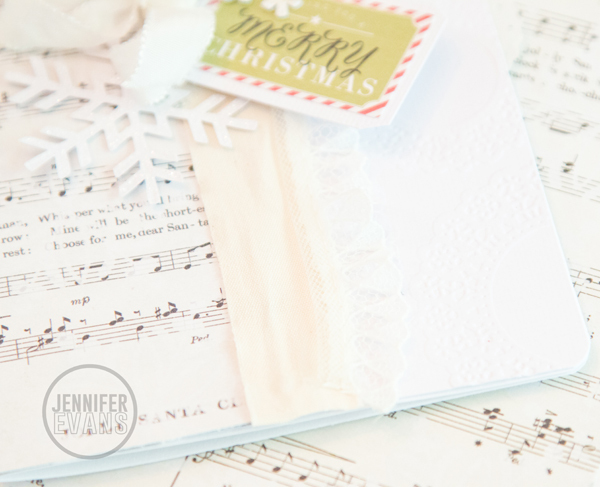 It always stays true to "antique" white, linen, burlap, script, lace, and a lot of glitter! The art that is sold at the show changes with the trends and so might the antiques, but the colors and textures always stay the same. Thinking of the holiday show coming up inspired this card. Pink Paislee's Merry & Bright collection is perfect to get that antique look. I de-embossed white cardstock with Maggie Holmes' Crate Paper Doily Embossing Folder. Then, trimmed it with May Arts ribbon and SPC Lace. I tied a bow with Heidi Swapp Seam Binding and misted it with water to crunch it up. This kept the loops nice and high so that the words on the Merry & Bright ephemera tag could be read. Lastly, the snow flake was added from the ephemera pack as well! Create Well: Go and visit your favorite holiday shops and take note of textures and colors. Let that kick off your next project!